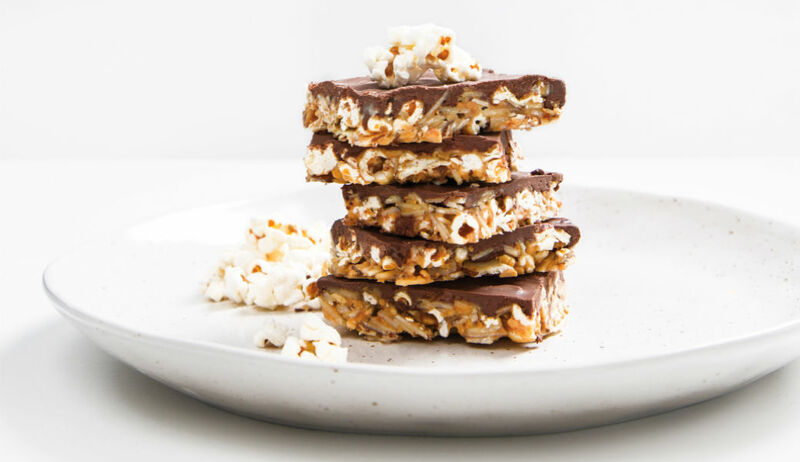 Today is International World Vegan Day so to celebrate we decided to share with you a super tasty and 100 percent vegan treat that Emily White from Emily’s Formula shared with us in our October/September issue! Combine cacao butter and maple syrup ingredients in a small saucepan, and gently melt at a low heat. Once it is all combined and cooled slightly add cacao powder. Adjust sweetness if needed. Line a 20cm pan, with baking paper. In a saucepan melt nut butter, honey and coconut oil. Set aside. In a large bowl combine popcorn, almonds and coconut. Pour nut butter mixture into the large bowl and stir to combine, breaking up popcorn slightly as you go. Press mixture into the pan. Use a separate piece of baking paper to help pressure the mixture down so it is super flat. Warm coconut cream in a small saucepan until it has almost reached a simmer. Do not let it boil! Remove from the heat and add the chocolate, stirring until it has melted. Pour over the mixture. Freeze for about 20 minutes to set. once set cut into 12 bars. Store in the fridge. This recipe was originally featured in the print version of M2Woman Magazine, to get even more recipes, you can purchase the magazine from our shop.